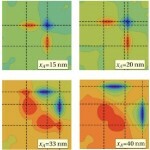 Calculation of electronic and thermal transport properties in nanostructures. Calculation of electronic structure and properties of semiconductor nanostructures. Dynamics and control of electronic and spin states in nanostructures for use in technologies related to quantum information.